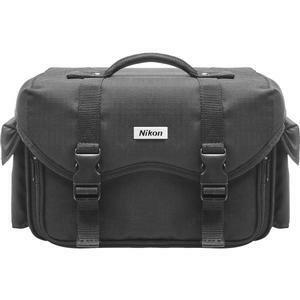 Protect your valuable camera with this Nikon Brand multi-compartment carrying case! 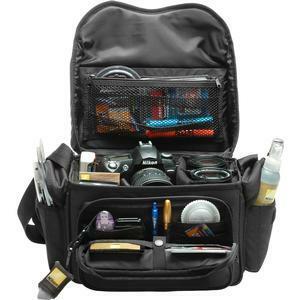 This case will easily hold your camera, lenses, grip, flash, and accessories. 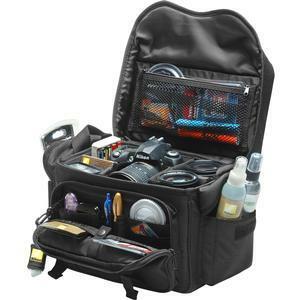 It's made from durable Cordura Nylon, and outfitted with a leather reinforced handle. 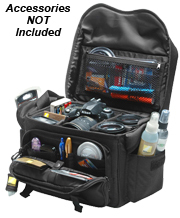 The front and 2 side pockets allows easy access to hoods, memory cards or batteries. Travel is made even easier and safer with the slip-resistant shoulder strap. A mesh pocket inside the top flap safely protects filters, pens, cleaning supplies, and lens caps. Removable velcro dividers provide individual customization to your equipment. The best feature, however, is its large (12 .